The Spirit Awards, as my friend Steve Gaydos wrote on Twitter, were very dispiriting. All the brand names won. The unknowns remain unknowns. Movies like “We the Animals” were used by Film Independent as bait and switch filler . Plus the winners clearly were not surprised. Their names were on Teleprompters. As Amazon film chief Ted Hope wrote, the statues went up on the podium before the names were announced. Hmmmm. So “If Beale Street Could Talk” was the big winner. They got Best Film, Director (Barry Jenkins),and Best Supporting Actress (Regina King). “Beale Street” had the highest gross of any of the nominees. 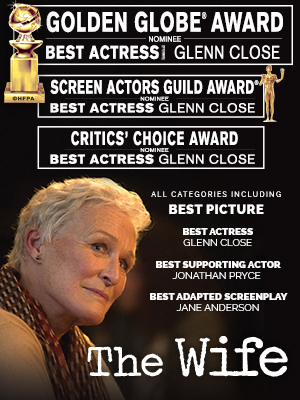 Best Actress went to Glenn Close, who brought her dog with her and looked ebullient from the moment she arrived. Ethan Hawke won Best Actor. Richard E. Grant won Best Supporting Actor. Best Screenplay went to the Oscar nominated “Can You Ever Forgive Me?” Close, Grant, and King are all also Oscar nominated. “Roma” won Best Foreign Language Film. “Eighth Grade” and its director, Bo Burnham, won Best First Screenplay. “Sorry to Bother You” won Best First Feature. Morgan Neville won for “Will You Be My Neighbor?” even though he was snubbed by the Oscars. Does it seem like the fix was in? Or that this was the Gotham Awards from last November? No real indie people won, and there were no surprise winners who came out of nowhere. But it’s all good, and Joaquin Phoenix, who did show up not knowing all this, for “You Were Never Really Here,” can pretend he wasn’t really there. We’ll find out on Monday if anyone watched the show on TV. I napped, as I predicted, during the tribute to “Suspiria,” a movie no one saw– but obviously Film Independent thought it would be a hit when they announced the award before the film flopped.